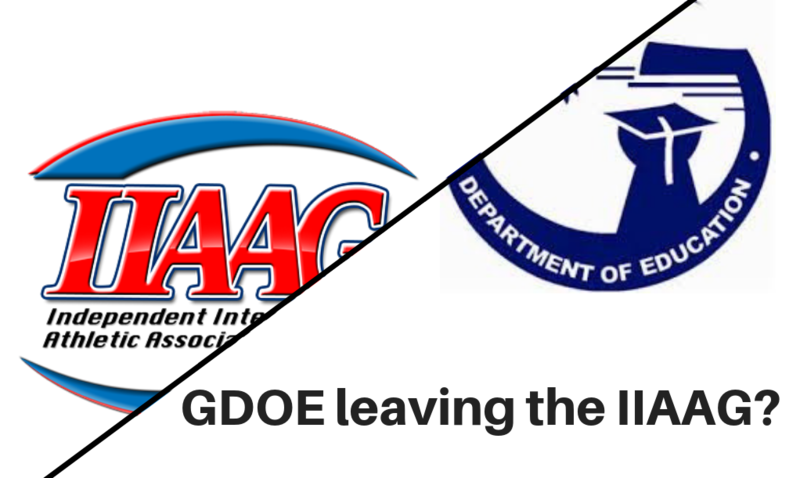 There has been plenty of confusion regarding the idea of GDOE looking to separate themselves from the IIAAG, which was announced by GDOE Superintendent Jon Fernandez last month. Many have expressed their displeasure of the idea through GSPN’s Social Media. 78% of over 700 voters said it would be a “Bad Idea” for GDOE to leave after holding a GSPN poll on Instagram. On top of the decision making process for the GDOE leaving the IIAAG, GDOE will eventually hold a public hearing for the others to attend to voice their opinions. GSPN reached out to Fernandez for updates on the issue, what started the conversation of possibly leaving the IIAAG and some insight on what that it means for private schools. GSPN: What was it that sparked the possibility of GDOE looking into separating themselves from the IIAAG for high school sports and why? Fernandez: Just to clarify, the IIAAG oversees GDOE’s high school sports as part of a contract that expires in 2019 (I believe late in the year). The contract is issued as a sole source contract to IIAAG. Procurement law requires that government agencies explore whether or not services are able to be provided internally before outsourcing. Further, if the service is to be outsourced, procurement law requires that government agencies seek competitive services — only if there is one provider can an agency justify a sole source contract. Therefore, part of what we are doing now is to ensure transparency and compliance with procurement requirements. What sparked the discussion last month was a committee work session where the committee chairman, Mr. James Lujan, expressed his view that GDOE needed to provide more oversight over its sports programs and student athletes. He requested that we ask our public school stakeholders whether it made sense to remove GDOE schools from IIAAG. Right now, we are taking that direction and gathering input. GSPN: Where does GDOE stand now? Has there been discussion of the matter and what seems to be the overall consensus within the organization? Fernandez: I’ve seen a lot of concern online expressed by private schools, but there seems to be support within GDOE to further look into the idea of either GDOE pulling out of IIAAG or looking for other partners, including the Guam National Olympic Committee (GNOC), for instance, to assist. GSPN: As mentioned in the press release, there were plans to include private schools to be allowed to play in the GDOE league if the separation were to occur. What would be the process those schools would have to go through to be included? Fernandez: Because no final decision has been made, I think it is fair to say that all options would be considered. GSPN: Would the GDOE league still be a go even if private schools decide not to participate or does the possibility of a smaller league, with seven less teams in each sport, not affect the decision? Fernandez: We have six public high schools. I don’t think that the number of schools competing will be a driving factor in the decision. GSPN: The IIAAG is currently comprised of the Athletic Director(s) from each school. Would each school still be involved in decision making/planning/rules/by laws in any ways like the IIAAG or will a separate body handle the GDOE league instead? Fernandez: The IIAAG actually designates principals but over time, principals have delegated their authority to Athletic Directors. We will definitely look at how things operate today and how major decisions are made. GSPN: If separation were to occur, how quickly would we start to see the change and would that mean GDOE will not be participating in the remainder of the IIAAG sports if a decision is made mid-season? Fernandez: As mentioned earlier, IIAAG is under contract until late 2019, so we have time to review this matter and make an appropriate decision within that timeframe.